Hello. I'm new here. I really need your help. Yesterday, after 2 months, I received my brand new Oclaro 638nm 700mW laser diode with driver for the Oclaro Laser Diodes. Unfortunately, something went wrong... I connected my diode like you connect the diodes from DVD's. When I hadn't seen any light, I did a little research and I found a data sheet for the Oclaro HL63193MG diode. I found that the flange (pin 2) is not connected, just pins 1 and 3.So, I soldered the pins 2 and 1 (minus) and the third pin I left unchanged, like on the picture. Nonetheless, my diode still doesn't light up.. The current flow is at 0mA. I connected my laser driver to a normal DVD laser diode only to check the setup and on a MultiMeter I saw about 200-300mA. 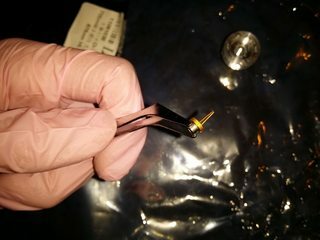 Did I kill my laser diode? Or maybe it's still working and I just connected it the wrong way? I secured my LD by one opposite diode. How did you install the diode into the heatsink pill? The bottom of the diode looks a bit beaten upon. If you have a DMM with a diode test function use that to see if there is any continuity through the laser diode. If your driver is working with a DVD diode but you're seeing zero current with the Oclaro I'm afraid I'm not terribly optimistic. My LD is secured by one [opposite polarisation diode? wstaw tutaj fachową nazwę na to]. I guessing you used the glass diode like you would with a mechanical relay across the winding to dissipate any stray voltage? Never seen it done like that before with a laser diode. I'm thinking that was where it went wrong. Hopefully I'm wrong, I just giving it a guess?? Hope you figure it out . :thinking: hopefully your LD is still good. and check the current draw again. If the Current is still 0mA then the LD is DEAD. Did you make sure you didn't overheat the diode while soldering? Why are there two anode leads? Perhaps one of them shorted to the case? Anode and cathode leads are stripped back way too far. What driver are you using? I'd remove those leads and redo those solder joints properly, then test again. Take out that reverse protection diode too, assuming you're using a good driver it should have one built in. Have you verified there's a voltage across the diode when you have it hooked up and turned on? Once you've got it working put some heat shrink wrap around the LD connections to help secure them and prevent shorts. Something is definitely wrong if you're getting 0mA. Well, soldering looks bad, becauee it was just a temporary solution until I properly calibrate the driver with ammeter. Aftret that, I wanted to solder the diode directly to a driver board. I use THIS driver, and yes, the glass diode is for reverse polarity protection and ESD. I hate to beat a dead horse, but you need to practice your soldering technique. It is beyond bad and could be the reason the diode is not working properly. The driver you are using needs to be set for the proper current and that can only be done with a dummy load (test load). 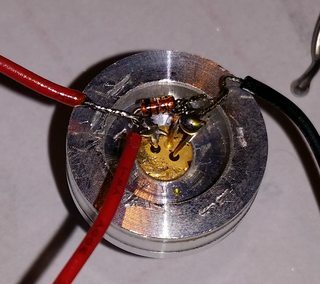 The diode you soldered to the laser diode is unnecessary and if the LD is still good, should be removed. I'm guessing you are using an unregulated solder pen with a large tip. These are cheap for a reason and I would get rid of it and invest in a proper regulated solder station that has interchangeable tips and can be adjusted. Without one, you may be losing many more diodes in the future. I see a monkey thumb under those gloves. This has got to be a joke, if it isn't please excuse my post, but it sure appears to be. to get to the store. to high a wattage and WILL overheat your LD. you can burn your name on your door (if it is wooden), kill bugs.